Pretty Is by Maggie Mitchell is told from the alternating points of view of two women who, as 12-year-olds, were abducted and held captive for two months in an isolated forest cabin. Their kidnapping, unsurprisingly, has had a lasting effect on each of them - but not necessarily for the reasons you might imagine. Lois is now a college professor and has written a novel, under a pseudonym, based on her experiences; Carly May has become Chloe, an actress whose career is already starting to fade at 30, and who auditions for a leading role in a film based on Lois' book. It's been almost twenty years since the women last met, and each of them has, to some degree, a new identity. Will meeting again help them to make more sense of the weeks they spent trapped by their mysterious abductor? And why is Sean, a strange, awkward student of Lois's, so obsessed with them both? Pretty Is seems to be billed primarily as a psychological thriller, but I think readers who are looking for a more straightforward page-turner might be disappointed: there are no neat resolutions here and many questions are left unanswered. 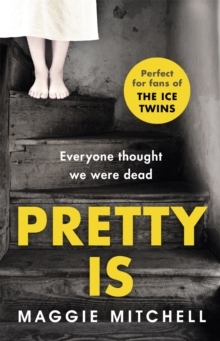 The cover suggests it's 'perfect for fans of The Ice Twins' but it really is nothing like it. Interestingly, Chloe describes Lois's own novel as "marketed [...] as a sort of chick-lit/thriller hybrid of the more literary variety", the sort with a cover that depicts "a scenario that doesn't appear in the novel" and which is "more interested in what goes on in the characters' minds"; this would be a pretty fair description of Pretty Is, too. It's a perceptive, well-written novel, but there is no neat resolution with regards to certain characters' motives, and while I enjoy ambiguity in fiction, this was a little frustrating. Both Chloe and Lois are well-drawn, credible characters - as children, they were pigeon-holed as the pretty girl and the clever girl respectively, but it's clear that they are both far more than this, something their kidnapper appeared to recognise. Each of them is also realistically flawed - Chloe almost certainly has a drink problem, while Lois ignores all warnings and takes foolish risks in her dealings with Sean in order under the pretext of inspiration for her second novel. Most importantly, each of them appears to be struggling to acknowledge the most uncomfortable truth of all about their time in the woods with kidnapper Zed - a time we only really see through the filter of Lois' fictional account of it, some of which Chloe disputes. How reliable are their points of view? How well did they really understand their mysterious captor? There are elements of the plot here that do stretch my belief - I think Lois' identity would have been revealed in the media the moment her novel became a success, for example, and there is an incident involving two child film actors towards the end of the book which I simply don't think would have come close to happening on a film unit base - but overall, Pretty Is was a thought-provoking, character-driven read about obsession, identity and guilt. My thanks to the publishers for sending me a copy of Pretty Is via NetGalley in exchange for an honest review.